(Nanowerk News) Since its development in China thousands of years ago, silk from silkworms, spiders and other insects has been used for high-end, luxury fabrics as well as for parachutes and medical sutures. Now, National Science Foundation-supported researchers are untangling some of its most closely guarded secrets, and explaining why silk is so super strong. 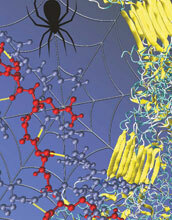 Research finds weak hydrogen bonds contribute to the amazing strength of silk. The journal Nature Materials reported the findings online March 14.